Welcome to Ivan DealMaker Best Deals In Town! I offer Business Brokerage Services in Four Languages! Bulgarian, Russian, English, & Macedonian!Buy,Sell,Trade Your business FOR SALE! Call experienced transfer specialist Ivan DealMaker For a Confidential Interview 813-215-6801! We are Business Brokers in Tampa Bay Florida. We help entrepreneurs buy and sell a business, including franchises. We are your one-stop shop to buy or sell a Business in Tampa Bay Florida. You can view 1000+ Tampa Bay Area businesses for sale listings. You can also Search over 3,000 businesses for sale listings in Florida. Our Business Brokers have over 100 Businesses for sale listings in Tampa Bay that you can buy for less than 50K down and over 100 Tampa Bay Florida restaurants for sale listings. We also have dozens of Gas Stations and Convenience Stores in Tampa Bay area for sale. Are you interested in Franchise Businesses? You can search for both new Franchises or Re-Sales Businesses. Get tax planning tips for buyers and sellers of new and established businesses. Receive new business for sale listing alerts via email. Get a free sold Business/Valuation reports of what Florida businesses have recently sold for. You can use this information to decide if you really want to sell your business at this time or in a few years. There is Information on different types of Business Valuations. On this site you can Learn about SBA 7a loans and financing goodwill. On this site you can also find Florida businesses for sale that already have SBA financing in place. On this web site you can find Businesses that qualify for and receive information on E-2 and L-1 Visa's. On this web site you can also learn how you can use 401K or IRA to buy businesses or Franchise without Tax and Penalties. Besides Main Street Small Business Brokerage, we also practice Synergy Mergers and Acquisitions, Franchise Re-sales businesses, Medical Practice Brokerage and Health Care related Businesses for sale. In the surrounding areas of Tampa St. Petersburg, Clearwater, Palm Harbor and Brandon Florida, our clients can get information on the different medical practice and services such as Medical Home Care, Medical Chiropractic, Medical Pharmacy, and much more. Ivan DealMaker Business Broker can help save you time and money when buying or selling your business thru one of our Business Brokers. Why Ivan DealMaker Business Broker? Why use Ivan DealMaker Business Advisor to assist you with Buying or Selling a Business or Franchise in the Tampa Bay Area? According to the SBA, there are over 1 million small businesses (with at least one person on the payroll) in the state of Florida. 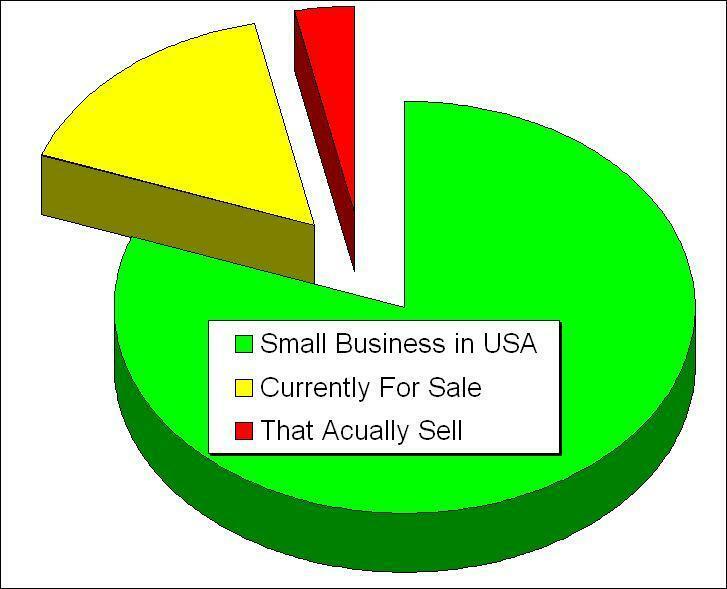 At any given time, 20% are for sale. Of the 20% percent that are for sale, only 1 in 5 of those will ever sell. Without the help of Ivan DealMaker Business Advisor, you could be wasting your time on the 4 out of 5 samll Businesses for sale that will never change hands. 1. Justify the Business asking price for both Buyer and Seller. Prepare a comprehensive Business Valuation using several methods of Valuation.Ivan DealMaker Business Advisor has access to thousands of comparable sold businesses throughout Florida and including the Tampa Bay Area. Not being able to justify the price is the #1 reason why most businesses never sell. 2. Set up financing to buy a business, pre-qualify the Business for SBA Guaranteed 3rd party financing. Buyers want to leverage their money. Sellers want to cash out, any third party funds make the deal a win win for both buyers and sellers. Ivan DealMaker Business Broker works with many SBA Banks and we know which Banks will finance certain types of Businesses. This is the #2 reason why most businesses never sell. There are aspects of business real estate sales that seem pretty simple. There are many elements of a smooth transaction, however, that are complicated and daunting. The relationship between a business buyer or a seller and their agent is based on trust, shared goals and understanding. I strive to continually improve and to do this I listen and take the needs and wants into consideration. "I can help you with every aspect of buying or selling your business because I’m experienced, because I’m professional . . and because I care." Whether you are planning to buy or sell a business in Tampa Bay, FL, contact us today!